We have been writing on gaelic culture and language since 2010 [State of The Art / Staid Na h-Ealain ] and for the past few years in gaelic in our ‘Ghetto na Gàidhlig’ section. You can read all the previous content here. Our intention was to create a space for gaelic speakers to write in gaelic for other gaelic speakers. We believe that gaelic is a living language which is important to people far beyond the Gàidhealtachd. We believe its an important part not just of our collective memory, our land and our place, but for our common future and for contemporary Scotland. We also think its important to have gaelic in a non-gaelic context – in a publication which is mostly in English (and Scots) but where gaelic sits alongside as comfortably and as naturally as it should. But it takes time and expertise to commission and edit. We need your support to continue with the broad range of content we produce. We have only three days left of our annual appeal to support Bella. 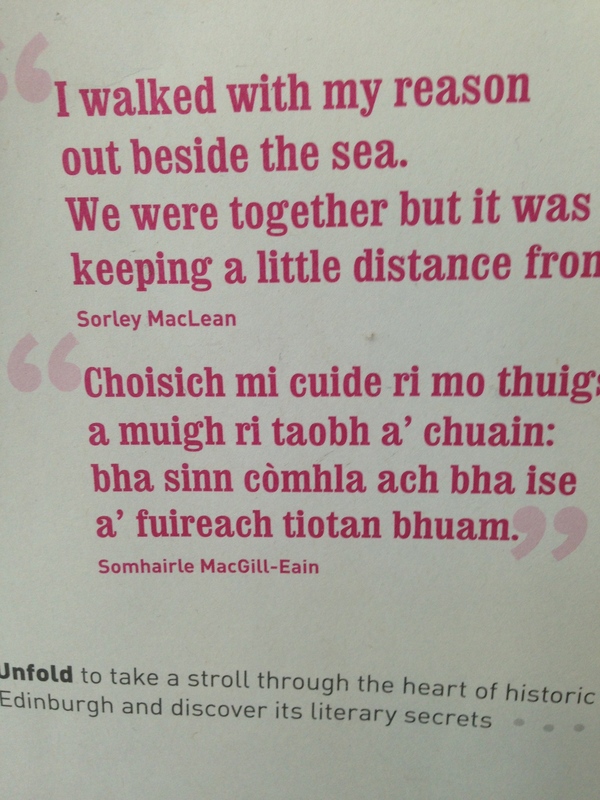 If gaelic is important to you as it is to us please go here to support us today. ’B e ar amas àite a chruthachadh airson sgrìobhadh ann an Gàidhlig, le luchd na Gàidhlig, agus airson luchd na Gàidhlig. ’S e ar beachd gur e cànan beò a th’ ann an Gàidhlig, a tha cudromach don dùthaich air fad. Tha sinn a’ smaoineachadh g’ eil e cudromach chan a-mhàin mar phàirt de chuimhne na dùthcha, ar tìr agus ar n-àite, ach airson Alba san àm ri teachd agus an dùthaich a tha sinn airson a bhith. Tha sinn cuideachd a’ smaoineachadh g’ eil e cudromach gum bi Gàidhlig ri fhaighinn ann am foillseachadh far a bheil Beurla agus a’ Bheurla Ghallta cuideachd a’ nochdadh. Ach tha e a’ toirt ùine agus eòlas airson obair a chur air chois agus a dheasachadh. Feumaidh sin ur taic airson leantainn oirnne leis an t-seirbheis seo. Chan eil ach trì latha air fhàgail dhen iarrtas bliadhnail againn airson taic a chur ri Bella. Ma tha Gàidhlig cudromach dhuibhse, mar a tha e dhuinne, nach cuir sibh taic ruinn an-diugh. Tha mise mothachail air na rinn Bella mu sgrìobhaidhean Gàidhlig fhoillseachadh agus ‘s iad a th’ air a bhith inntinneach. Chan eil fhios càit’ eile am faiceadh iad solas an latha, agus bu mhòr am beud mura faiceadh. Tha mi an dòchas nach tèid Bella fodha ach, gu mì-shealbhach, chan eil de dh’airgead agam na leigeas leam taic a thoirt dhuibh an-dràsta. Nuair a bhitheas, cuiridh mi mo làmh nam phòcaid. Tapadh leibh airson na rinn sibh agus gura math thèid dhuibh anns an ùine tha romhainn. Thanks KA Mylchreest and Am Morair Dearg. We were hoping to our too irregular gaelic content but due to the poor response to crowdfunder this will be difficult. However we will not go under and will continue as we can. Is there any means of translating the Gaelic into English?